If you’ve been a reader for long, you know that one of my main goals for summer dinners (besides binging on corn on the cob) is moving as much of the cooking outside to the grill as we can! 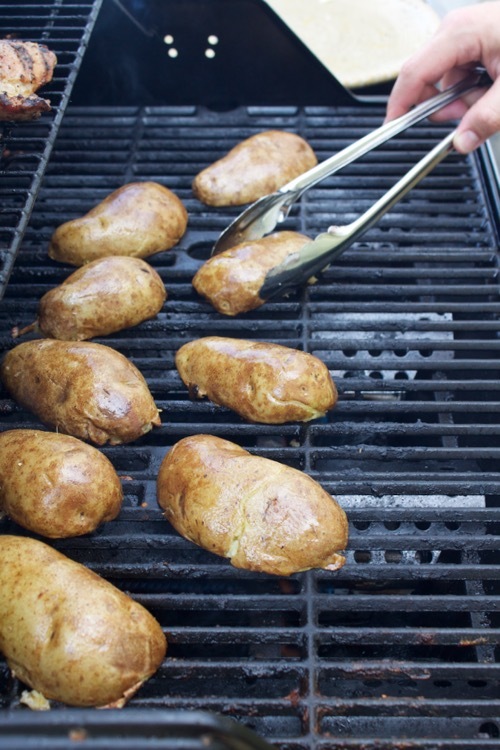 I love any meat on the grill, and these grilled potatoes go with anything. They couldn’t be easier – and they’re crispy on the outside, fluffy on the inside, and topped with melty cheese. SO GOOD. Start by piercing and microwaving a few potatoes (if they’re on the small side, I figure one potato per person, but if they’re big, a half can be a serving). I’m sorry I can’t tell you how long this takes – it depends on your microwave, the size of the potatoes, and how many you’re doing. Just keep cooking them for 3-4 minutes at a time, turning them over each time you check them, until they’re tender and give slightly when you gently squeeze them. Slice the cooked potatoes in half (carefully, they’re hot!) and drizzle them lightly on both sides with olive oil (or you can brush it on) and sprinkle them with salt and pepper. They’re ready for the grill! 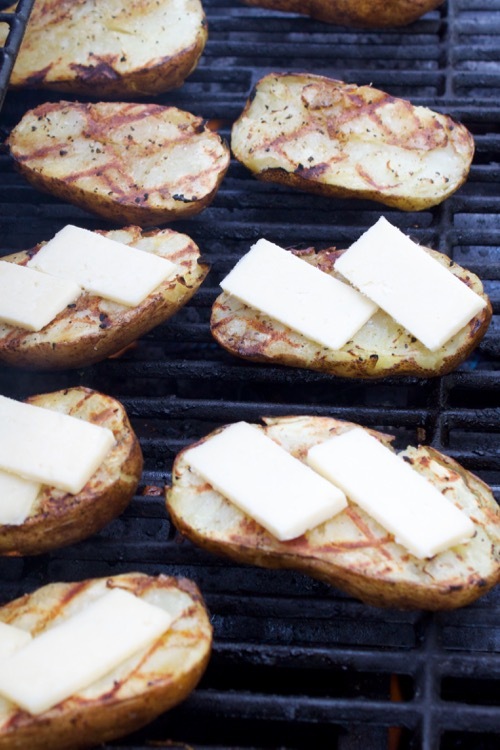 Grill the potatoes on both sides, then top with the cheese slices and wait for melty magic to happen. I highly recommend serving grilled potatoes with my family’s favorite grilled chicken…or these pork chops…or heck, a hot dog! You’ll love their crackly crisp skin and edges, and that sharp cheddar oozing over each bite. Yay summer! When the potatoes are cooked, carefully slice them in half lengthwise and brush them lightly with olive oil. 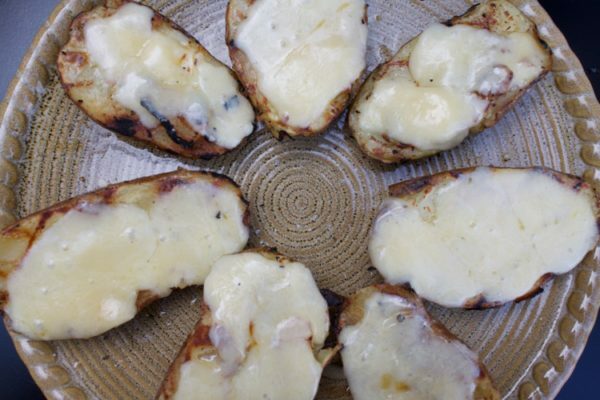 Sprinkle them on both sides with salt and pepper and deliver the potatoes and cheese slices to the grill. Place the potatoes on the grill cut-side down over medium-high heat. Grill them 1-2 minutes, until lightly browned and crispy (you can rotate them partway through for grill marks). Turn them over and carefully top with sliced cheese. 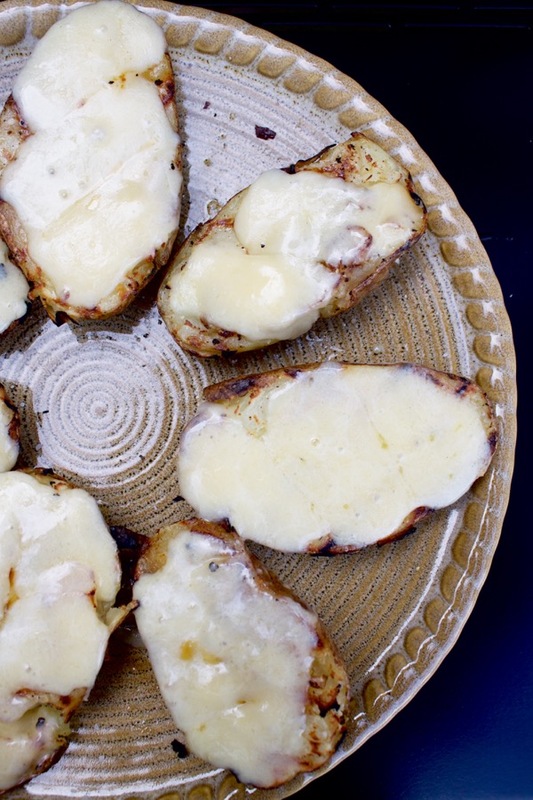 Put the top of the grill down to melt the cheese while the bottom crisps up (about 2 minutes). If your potatoes are very large, half of a potato can be a serving. You can easily adjust the recipe to serve as many as you would like! The prep time includes microwaving the potatoes, which will depend on the size of the potatoes and your individual microwave. This elevates a baked potato to a whole new level! Slightly smoky-tasting and SO delicious! We grilled some at our pool last night, and so many people came up to Craig commenting on how it was such a great idea, and how they were going to have to try it. They definitely were yummy! I want this RIGHT NOW, but it’s 1:30 in the afternoon and raining. Haha! Perhaps some sort of oven potato skins..?!? !